Our mission is to improve efficiency, accuracy and productivity through the implementation of a statewide ERP software system that is a single source of information for Financials and HR/Payroll transactions. State employees will be auto-provisioned into CAPPS HR/Payroll via the onboarding process and account information will be forwarded to the employees agency sponsored email within 5 working days of the employees hire date. If account information is not received within 5 working days, please request assistance via the level 1 helpdesk at: CAPPS_Support@military.texas.gov. 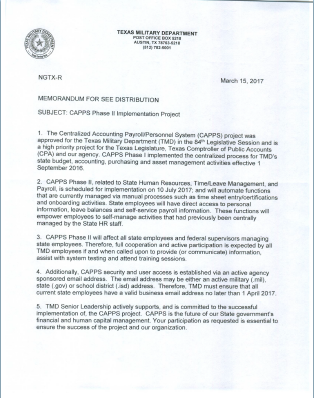 All federal/military supervisors that directly supervise, or are in the second line of supervision for state employees, must complete the Military Supervisor CAPPS Account Request Form and the CTIA Form to establish a CAPPS user account. Completed forms must be returned to the level 1 helpdesk at: CAPPS_Support@military.texas.gov.